New Zealand is both a pluvial and fluvial country. 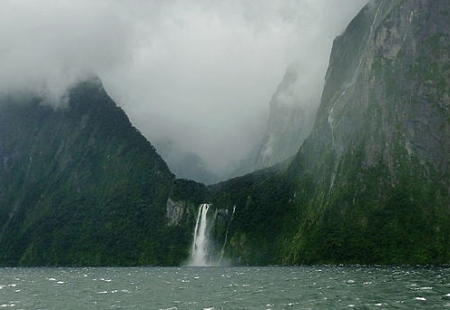 A lot of water falls on, moves through, and runs off the landscape to the surrounding seas. At each step along the way water can play a role in shaping the landscape, whether by resisting or facilitating erosion or by providing environments where eroded sediment is deposited. The resulting landscape becomes a collage of many different erosional and depositional fingerprints. Here’s how they work. Erosion by water begins as soon as raindrops hit the earth. The impact of innumerable droplets on exposed soil will tend to mobilise and catapult soil particles into the air. While this is a random process, over time the particles will gradually move downslope because they are afforded more time to travel. This is one of the various reasons why hilltops tend to be round. Once within the ground, water can play a number of different roles that either foster or inhibit erosion. In alpine and other cold environments, freeze-thaw cycles of water act to wedge soil and even rock apart. This provides fresh material for mobilisation by water, wind, or simply gravity. Water within the soil also controls the amount of vegetation cover. Plants can inhibit rain splash, aeolian and fluvial erosion, as well as landslides, but they can also accelerate bedrock weathering either with their roots or plant-derived chemicals. Vegetation-mantled landscapes are often able to attain steeper slopes than those with little or no vegetation. The presence of water in the soil affects landslides in other ways too. Water alters the balance of forces that restrain or drive soil layers sliding downslope, and while there are a number of opposing effects here, heavy rainfall tends to trigger landslides and other forms of mass wasting. This leaves scars on hillsides and deliver substantial pulses of sediment into river networks below. Depending on the geology, water may also act to shape the landscape by dissolving the rocks. This is most apparent in limestone and other karst landscapes. Slightly acidic water (typically containing dissolved CO2) reacts with carbonates, slowly dissolving the rock, and leading to smooth rock surfaces and underground caverns or streams. An excellent example of this lies in the Cass Basin in Canterbury. It is aboveground, however, where water does most of its erosional work, either as solid glaciers or as liquid streams and rivers. The slow work of glaciers has left an indelible mark on New Zealand’s landscape, particularly in the South Island. Forming high in the wet and cold mountains, the base of the glacier moves slowly over the ground surface, abrading and plucking the rock away. Over time, this produces and rafts down-valley coarse sediment that forms moraines or fine sediment known as glacial flour. During past glacial periods, glaciers carved out large depressions now occupied by lakes and produced much of the sediment that now constitutes the South Island’s coastal plains. You can recognise valleys carved by glaciers by their U-shaped profile and hanging tributaries, both of which are common in Fiordland. More widespread, of course, are rivers. Rivers are spasmodic conveyor belts of water and sediment, defined by the local interplay among erosion, sediment transport, and deposition. The ability of a river to erode its channel and transport sediment climbs exponentially with the flow rate, which is why floods are the most capable of reforming channels and carry the greatest sediment loads. All river networks are to some degree dendritic, with smaller streams flowing together to form larger rivers, but geology and topography play important roles too. Streams draining Mt Taranaki, for example, are radial by virtue of the volcano’s conical shape. 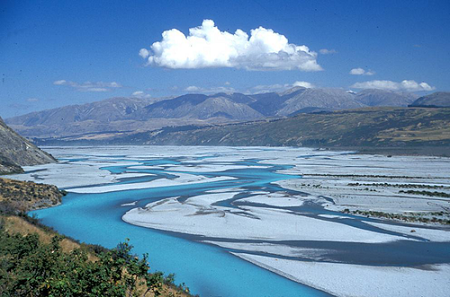 When rivers are not jostled into position by neighbouring hills, they may be free to meander (e.g, the lower Manawatu River) or form braids (e.g., the Rakaia River). What controls one form over another is a combination of landscape slope, room to migrate, water flow, sediment supply, and sediment size. Steeper plains with high fluxes of coarse sediment are more likely to form braids, while meandering is favoured on gentler plains with fine sediment. 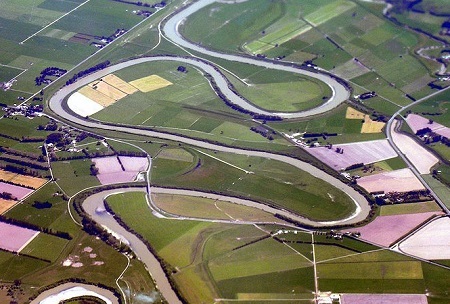 Meander bends of the Manawatu River at Highway 56. [Credit: Image by Phillip Capper, licensed under Creative Commons Attribution 2.0 Generic license). As sediment-laden streams or rivers exit hills and start flowing across an abrupt reduction in ground slope, the flow slows down and the sediment can be deposited on the channel bed. As the channel bed becomes gradually higher, flooding may cause the channel to shift (or “avulse”), allowing sediment to build up at other points on the evolving landform. Over time this leads to what are called alluvial fans, where the channel effectively pivots about its source at the foot of the hills. 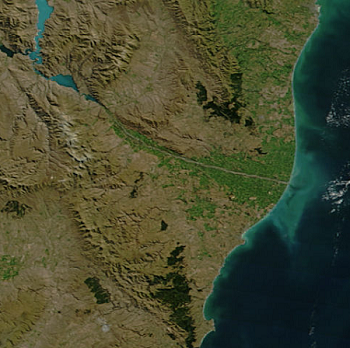 The Waitaki River near the coast has, over past glacial cycles, formed an obvious alluvial fan. If multiple alluvial fans are formed by neighbouring rivers, and become so large that they begin to coalesce, they become what is known as a bajada. The Canterbury Plains is an example, and the subtle depression where adjacent fans meet is often where subsidiary rivers form, such as the Selwyn River. When rivers and their remaining sediment load reach the coast, another suite of geomorphological processes comes into play. Depending on the type of sediment that comprises the shore, the slope of the near-shore environment, the direction and energy of the wave action, and any additional coastal sediment, a new suite of coastal landforms can arise. These include depositional features such as deltas, beaches, ridges, and spits, as well as transitional water bodies such as estuaries, coastal lakes, and hapua (the latter being the subject of a later article). The outcome of all the fluvial and water-dependant geomorphic processes described above, modulated as they are by climatic and geological circumstances, is a diverse and interesting landscape that co-evolves to a degree with the regional water cycle and terrestrial ecosystems. The fluvial landscapes in turn provide the varied habitats for a diverse array of aquatic life. Next time you drive or fly somewhere – across town or cross country – look out for these fluvial landforms. Now you’ll have a better idea of how they developed in the first place. Erosion by wind, after the Greek god Aeolus, keeper of the winds. Karst is derived from the German word for a barren limestone region around Trieste, Italy, Kras. From the Spanish word for slope, and pronounced with a soft and stressed ‘j’. Dr Daniel Collins is a hydrologist and water resources scientist (and geomorphologist-in-hiatus) at NIWA.